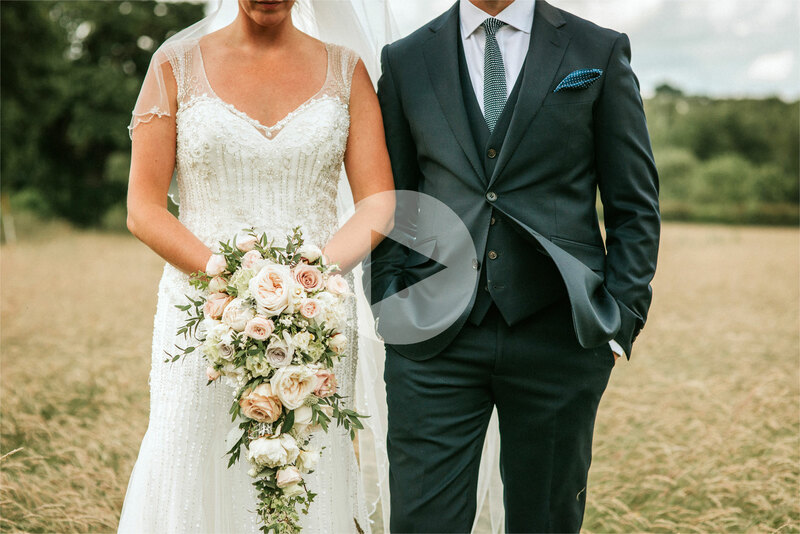 Vicky and Danny had their ceremony at Braughing Church, Hertfordshire, moving on to a beautiful marquee at Bury Green Farm to celebrate with friends and family. Vicky wanted a relaxed, rustic feel for the reception, which was taking place in an open marquee at Bury Green Farm. Rather than having a traditional, formal seating plan and meal set up, the couple opted for a more casual approach with food vans, no seating plan and additional seating provided by hay bail sofas! 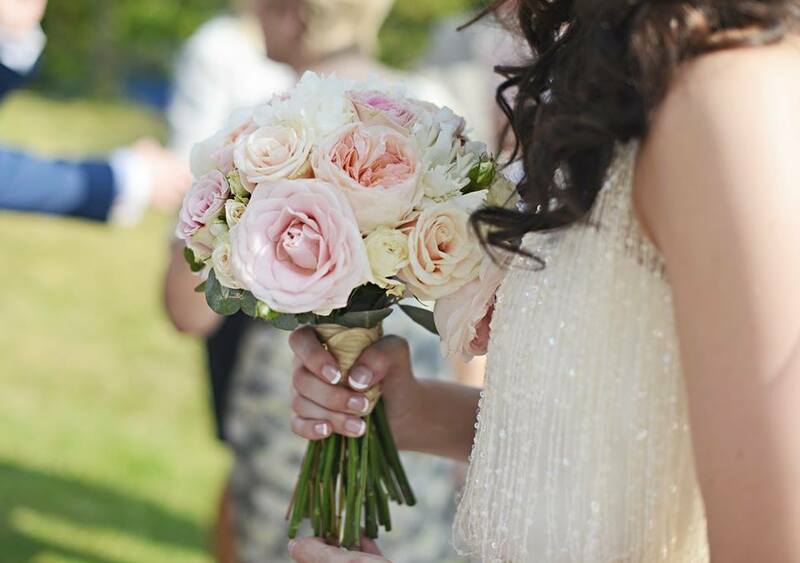 The colour scheme was shades of candy pink (blush and vintage), with soft peaches, ivory and green accents. Vicky wanted her arrangements to be very full, with the flowers in bloom and rounded in shape. 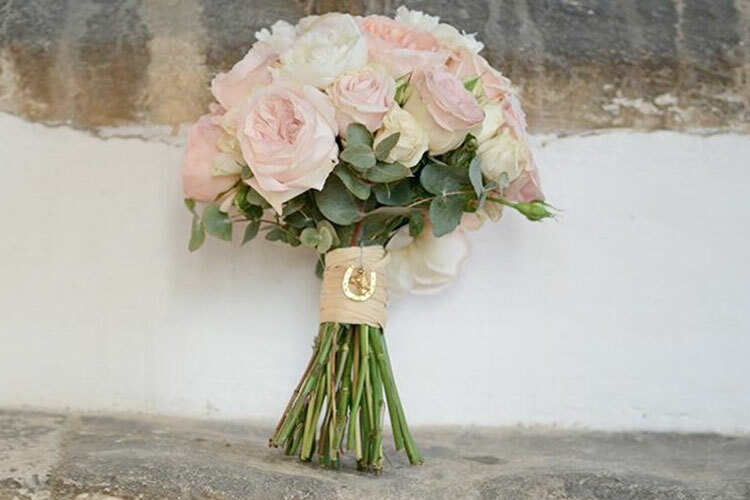 Her bouquet was a hand tied posy, in a rounded ball shape using garden roses in soft pink and large open roses in peach and pink, combined with smaller spray roses, white dahlias and mint green lisianthus. The stems were bound in raffia to keep with her rustic feel. 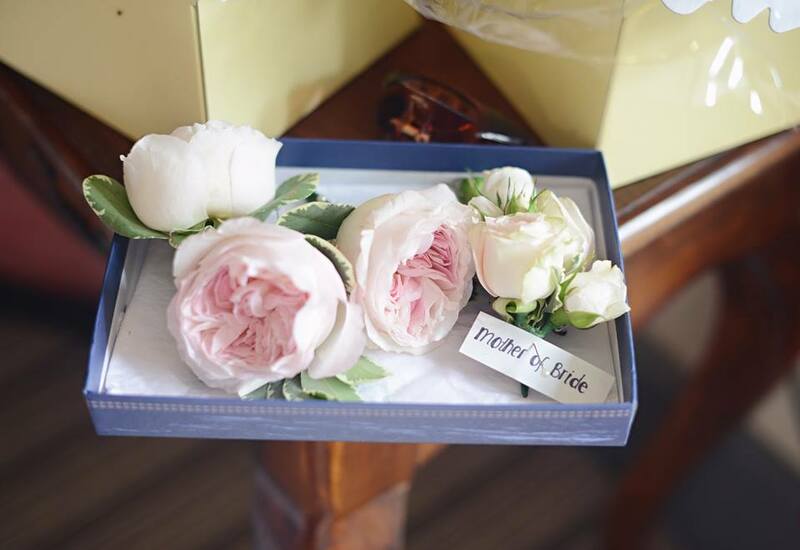 Vicky’s adult bridesmaid carried a smaller version of her bouquet, while the three smaller bridesmaids, who wore peach toned dresses, carried mini hand tied bouquets with the key flowers, in their full bloom state and wore head bands of spray roses. 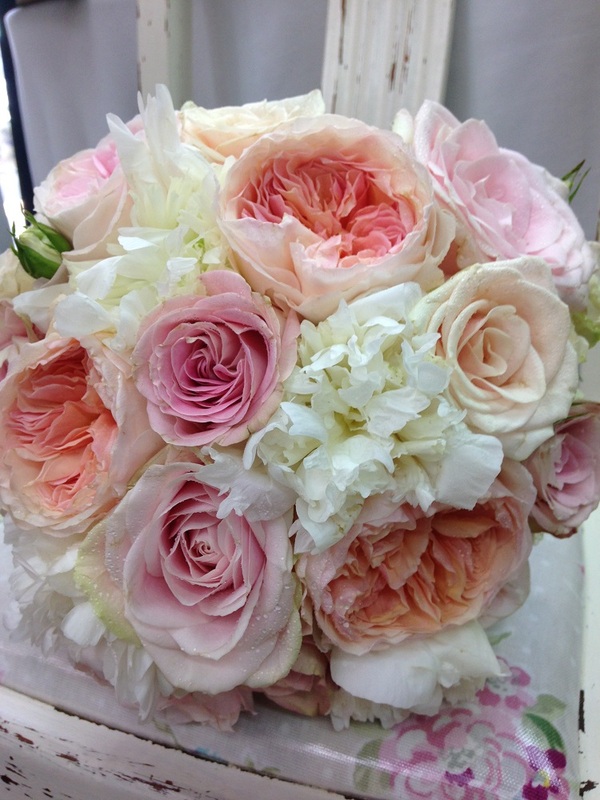 The men’s button holes were full and blousy soft pink garden roses. To decorate the entrance of the church Vicky ordered two of our beautiful lollipop trees, which stand 5 feet tall and included a ball of full, blousy flowers on top. 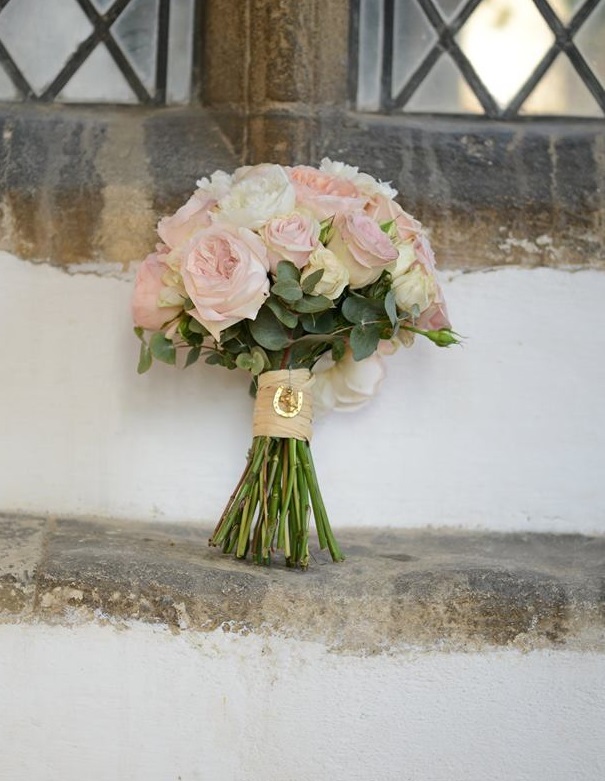 Vicky’s included the beautiful garden roses and the open peach and pale pink roses, lisianthus and dahlias, but to add the extra body and fullness required we included white, green and pink hydrangea. The beauty of these statement pieces is that after the ceremony they could be used again at the reception to mark the entrance to the marquee. 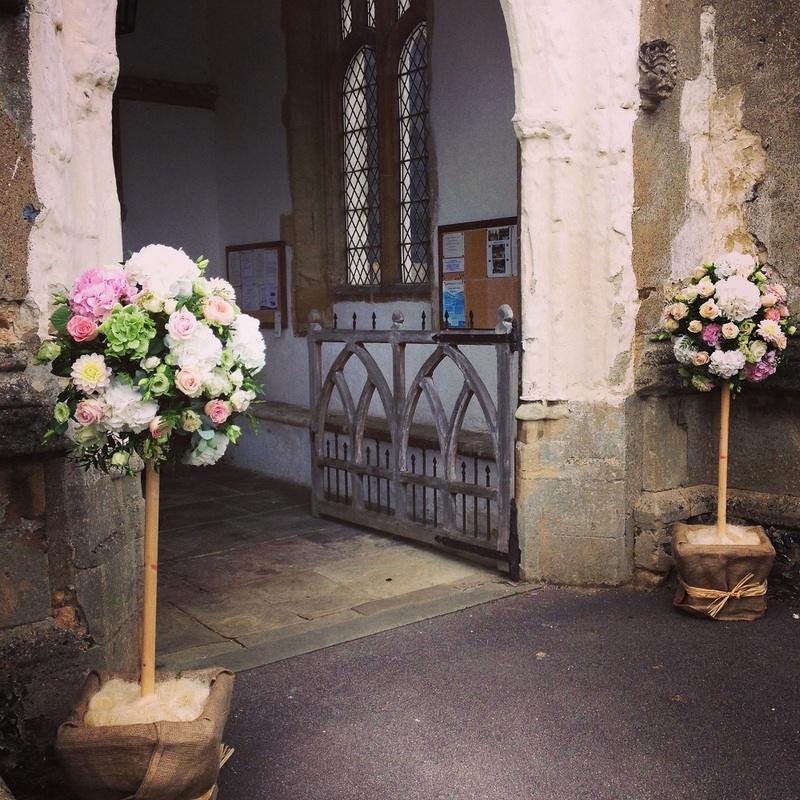 Inside the church, we echoed the round fullness of the lollipop trees in three urns which helped tie in to the theme of the couple’s big day beautifully. 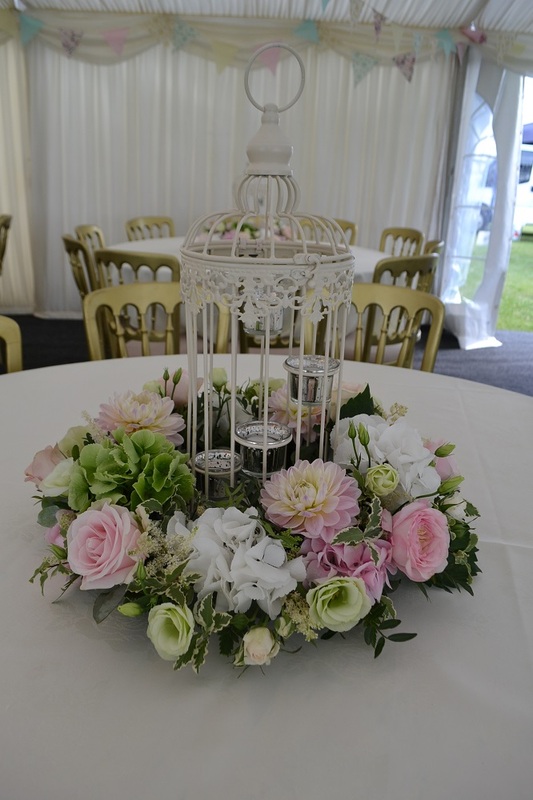 For the reception decoration in the marquee the colour scheme of the candy colours continued with the flowers surrounding our ivory birdcages, large and full rings of flowers around the base. 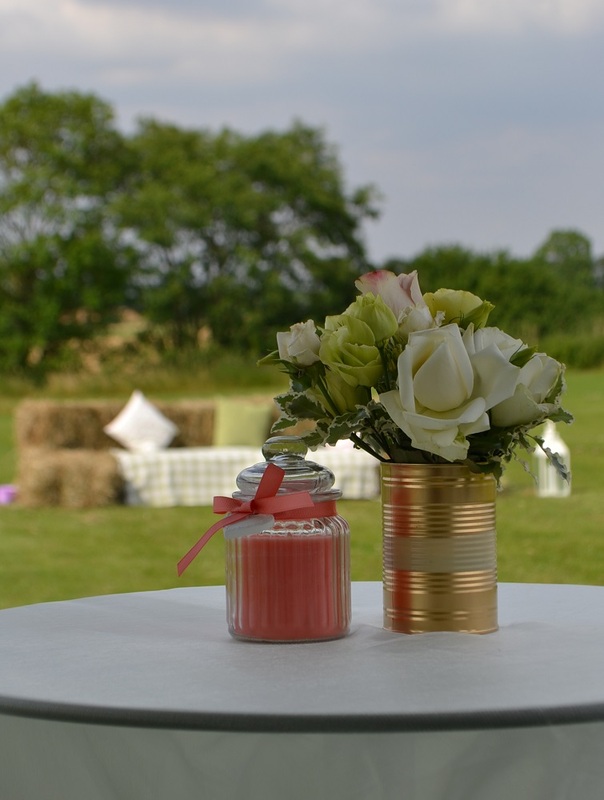 The poser tables were decorated with tin cans filled with small bunches of roses and lisianthus with the outdoor tables decorated with cream lanterns with a single garden rose wired on top. The whole feel of the reception was relaxed and playful with candy coloured paper pompoms hanging from the tent and the large oversized hay bale sofas for guests to relax on! 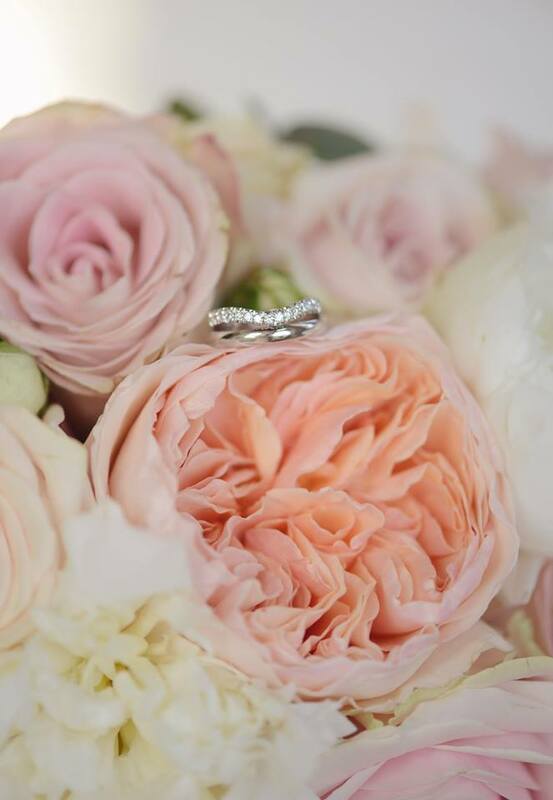 The flowers were a joy to create and we hope that Vicky and Danny had the perfect day! 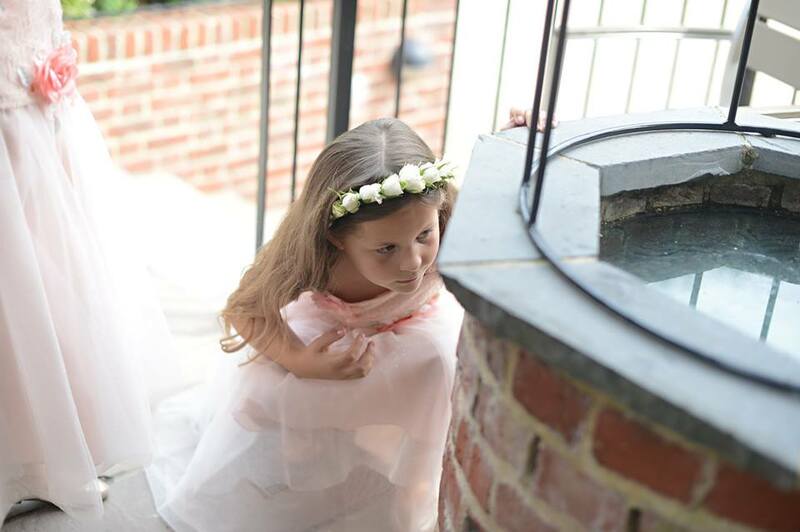 Thank you to Romarose Photography for the fabulous photos!